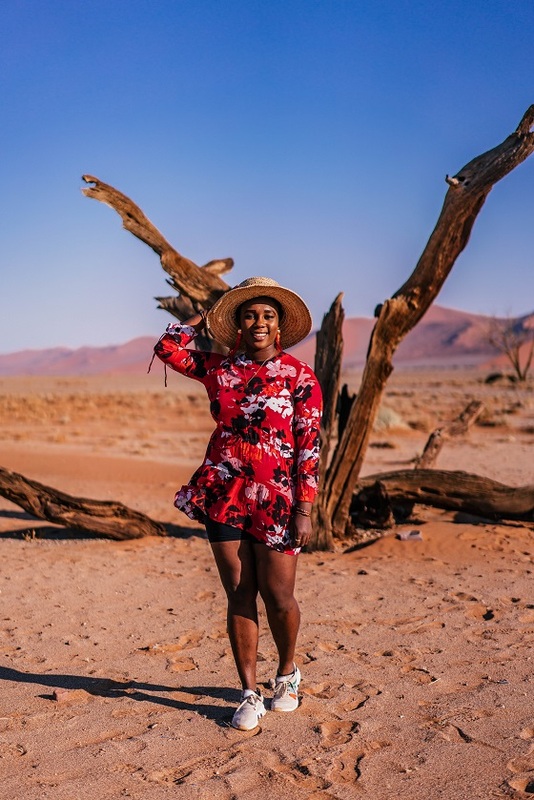 Victoria Alao, The Stylish Trotter joined our Ultimate African Overland Tour and below is the countdown to her favorite activities whilst travelling with us. One of the most enticing facts about touring Eastern and Southern Africa is the ability to complete several activities during the process of the tour. Some of these activities are listed in the day to day tour brochure provided by Acacia Africa prior to starting the tour. The tour members also find out about other activities upon arrival at different locations. In this blog, I will list some of the activities I participated in and they will be listed in order of preference with the last activity being my favorite. I will also discuss the cost associated with each activity and my verdict on the activity. Gorillas live freely in some parts of Uganda and Rwanda. The Gorillas are exposed to human interaction for 4 years before they are released to the jungle. This process is important in order to get the Gorillas used to trekkers who are curious about them and who will also like to see them. I was lucky enough to go Gorilla Trekking in Uganda and I underestimated how tasking this activity will be prior to partaking in it. The permit for Gorilla trekking in Uganda cost $600 while the permit cost $1500 in Rwanda. Therefore, it is more economical to complete this activity in Uganda. This trek is mandatory under Acacia Africa’s Eastern and Southern Africa tour. The day started at 5am and we were driven to the starting point of the Gorilla trek. The tour leader gives us a quick briefing, then we are divided into groups and told the name of the family of Gorillas we will be tracking in the jungle and how many members are in the family. The family my group was assigned to has some babies which were so exciting to me. We started trekking around 7am and we were told that the trek would take around 3 hours total. I was not prepared for the experience I had that day because the trek took a total of 9 ½ hours and I also sprained my ankle after stepping in Elephant poo. Would I do it again? Only if I can be promised that the trek will last 3 hours or less! 9 ½ hours was extremely tasking. During the game drives, I saw several Elephants, Zebras, Lions, Cheetahs, Leopards, Rhinos, beautiful birds, Hyenas, Hippos, Water Buffalos, Giraffes, Impala, Wildebeests, Oryx and the list is potentially endless. I will never forget the time when the safari truck got very close to a family of Elephants in Maasai Mara. I was in awe because these animals are so beautiful! I also saw a lot of Elephants in Chobe National Park which home to Africa’s largest Elephant population is. It has over 50,000 Elephants. The cost of entry into the National Parks is already calculated with the mandatory adventure pass. The price of this pass varies depending on the trip duration and it must be paid to the tour leader at the beginning if the trip. I particularly enjoyed the cruises (booze cruise as they are playfully called) because the experience includes unlimited alcoholic and non-alcoholic beverages for the duration of the cruise. I particularly enjoyed the cruise along the Nile River in Uganda because food was also provided. The cruise in Zanzibar had the best water because it was light blue and clear. Each cruise cost between $30 – $40 and the duration of the cruise is 2 hours. This experience was a first for me. I never rode a horse prior to visiting Malawi and I was very nervous. I highly recommend this activity in Malawi because the proceeds from the activity goes to maintaining the horses and charity. The name of the stable is Kande Horse Malawi, and the also sell beautiful dungarees which are locally made and the proceeds from the sales also go towards building a school for the locals. Some of the horses were rescued and cared for by the owner of the stable. The horses are very well cared for and well behaved. The activity cost $55 for a 1 hour horse ride and $70 for a 2 hour horse ride. The activity ends in Lake Malawi where the horses go into the water for a swim at the end of the ride. How cool is that? Victoria Falls is the highlight of a trip to Zambia. The fall is divided between Zambia and Zimbabwe, and there is an option to visit Zimbabwe to see the falls on that side for an extra fee. I chose to stay in the Zambia side, but I decided to take a helicopter ride over the falls for a more scenic view. The ride cost ~$250 per person for a seat on a 6 passenger helicopter. The experience lasted 30 minutes. I enjoyed the experience, but I felt that for the price there could have been less passengers on the helicopter. In retrospect, I would opt for the micro flight option which is a very small plane and it only allows the passenger and the driver on the flight. This experience was more intimate compared to the helicopter ride in Zambia. The helicopter takes 3 passengers at once, and the doors of the helicopter was open. This means we were able to see the Okavango Delta without restrictions. We saw a lot of animals while on the helicopter, especially Elephants. The experience cost ~$250 per person, and it lasted 45 minutes. South Africa is known to have some of the most delicious wines in the world. A trip to South Africa is not complete without a visit to a vineyard (or several vineyards) for wine tasting. The activity is relatively cheap and 5 different types of wine are served coupled with cheese or chocolate. There is also an option to buy wines from the vineyard after the experience. The wine tasting activity cost $10 each and the wines were paired with cheese and some snacks. Every member of the group participated in this activity because it is very interactive and fun! Wine tasting was one of my favorite activities. A large part of Namibia’s landscape is made up of the Namib desert! As a result of this, several desert related activities are available in Namibia. One of such activities is Quad Biking. This activity cost $45 per person, and it was a 2 hour experience. Remember to wear pants because the sand from the desert stings when driving the quad bikes at high speeds. The activity consists of 2 leaders. One always stays in front of the group and other stayed behind the group. This is to ensure the safety of the group members. The activity was so fun, and I was very happy that I participated. I would participate again in a heartbeat. I was digging out sand from my clothes and shoes after the activity, but it was worth it. Sky diving was my favorite activity among all the activities listed. This is because sky diving was a challenge for me. I fear heights, so I thought I could not complete it. The activity cost $165 for sky diving but videos and pictures cost extra. My total was a little over $300 because I paid for sky diving videos and pictures. This was an activity of a lifetime, so I thought why not? The activity starts with a briefing at the sky diving grounds and then we get on the plane with an experienced sky diver. I was latched on to my sky diver and at 30,000 feet, we dropped! Oh, my talk about adrenaline rush! After I landed on the ground, I felt untouchable and I felt I could do anything! The type of rush you get from sky diving is hard to explain. It must be experienced in order to be understood! Will sky dive again? ABSOLUTELY!